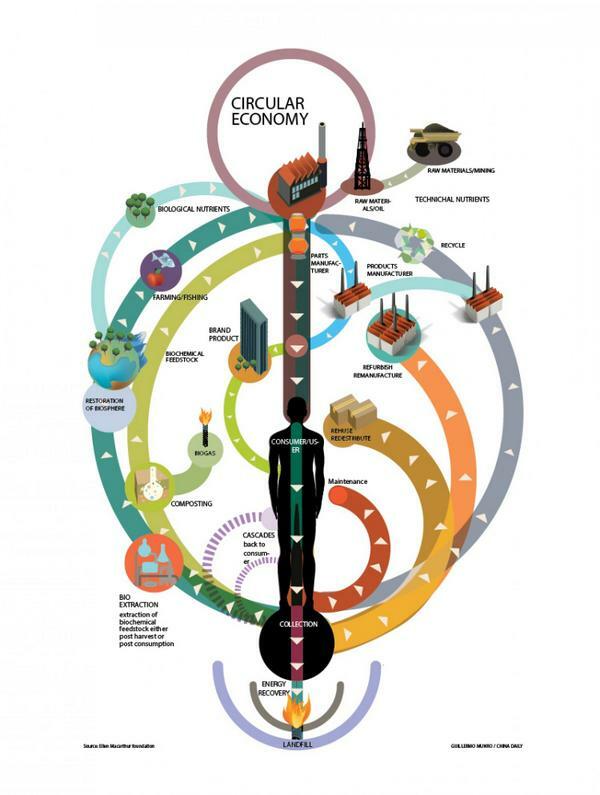 The circular economy has become a bit of a buzz word recently but I like this illustration which accompanied a blog post from the World Economic Forum which quite succinctly illustrates what we mean. The reason for the interest in the circular economy among policy makers is the simple fact that people are getting richer, demanding more ‘stuff’ – whether it be iPhones, cars, refrigerators, houses and of course energy – and procuring the required resources is getting harder. In a publication from 2012, Sustainable Technologies for the Next Decade, I discussed this issue and offered some solutions to avert the crisis. We have made use of every available resource, and while some, like silicon make up 25.7% of the Earth’s crust by weight and are to all intents and purposes inexhaustible, many others such as indium are not. the problem is compounded by many of the scarcer elements being a small cog in a large wheel, so while materials such as aluminium, steel and many plastics can be and are recycled, recovering the small amounts of indium from broken touch screens is neither feasible nor cost effective. Fast developments in new technologies often change the landscape of critical elements. Schemes are only being developed in some countries on a national level. There are, however, no initiatives that provide an early warning system that links fundamental research to industrial applications with unlimited scope across all elements and materials. In the last few years there are encouraging signs that policy makers are aware of the issue, but there is still a lack of coordination at a global level. The world is going through what some have described as a ‘Golden Age of Science,’ but more importantly the combination of scientific advances plus computing power plus Internet communication is allowing science to proceed at an ever faster rate, while the communications via the Internet, twitter and mobile devices such as iPads have increased scientists awareness of other disciplines. The age of microfiches and ordering reprints of journal articles is long gone, which has vastly increased scientific productivity. New materials and production methods are emerging, some of which have the potential to initially supplement, and possibly replace existing materials and production methods. While that means that business opportunities based on science and engineering are increasing dramatically, these must be carefully mapped to the addressable markets. We believe that ‘Doing More With Less’ and ‘Replacing Scarce Resources’ represent an irresistible market pull, and something that smart investors will use to channel the fruits of the new scientific renaissance. Or in todays terms, that means embracing the circular economy.